Elizabeth Barnabus lives with her brother on a barge in the Republic having fled a life of servitude in the Kingdom – or does she? 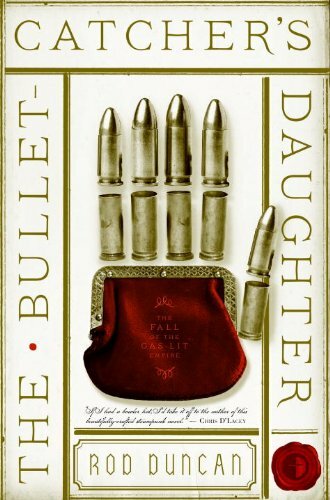 The Bullet Catcher’s Daughter is a riveting tale which moves swiftly and the reader will be gripped from the first page when Elizabeth has taken the persona of her brother, Edward Barnabus, a private intelligence gatherer. Disguised as a man for her work, Elizabeth meets with the Duchess of Bletchley who hires her, as Edward, to find her brother who has fled with an arcane machine, sought after by The Patent Office. Set just after the British Revolutionary War and the Luddite Revolution, when Britain is divided into two nations - the Kingdom of England and Southern Wales and the Anglo-Scottish Republic, The Bullet Catcher’s Daughter enthralls and there is no point at which I wanted to skip to the next point of interest as every sentence is compelling and so well written, that each is the next point of interest. Elizabeth encounters agents from the Patent Office, a travelling circus of curious, and frightening, characters, allies and tricksters. An exile in the Republic, she needs to cross the Boarder to The Kingdom in the knowledge that she could be caught and returned to a life of enslavement. The chapter headings are in themselves, intriguing and this first volume of The Fall of the Gas-Lit Empire really is unputdownable. Rod Duncan has successfully written an absorbing tale from the perspective of a woman in the early nineteenth century. This is science-fiction with the sub genre of Steampunk, so technology is unorthodox and fascinating. A cracking read, but I would advise starting with The Glossary at the end of the book before settling down to enjoy The Bullet Catcher’s Daughter and your reading experience will be further enriched.